Varieties Of Windows. Windows have their surfaces, as a general rule, flat, and more or less recessed from the surface of wall, in such cases they are known as " sash windows," as in fig. 1, Plate XLVII. A sash window may be either "fixed" in its casings or frame, or it may be "hung," as it is technically termed; that is, either the upper, as A, fig. 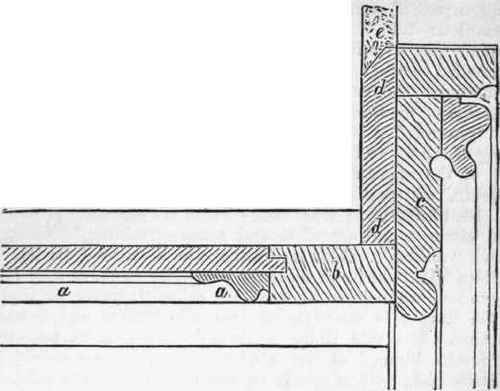 1, Plate XLVII., or lower sash B, may be capable of sliding up or down, the arrangement being known as "single hung;" or both halves A and B, as is usually the case, may be made to slide up or down, in which case the arrangement is known as "double hung." 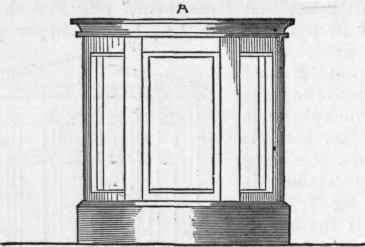 A "casement," or "French window," illustrated in fig. 1, Plate LL, has its upper part, as a, generally fixed, while the lower part is divided vertically into two parts Band C, which are made to open either inwards or outwards. A sliding or rolling window is shown in fig. 7, Plate XLVI. 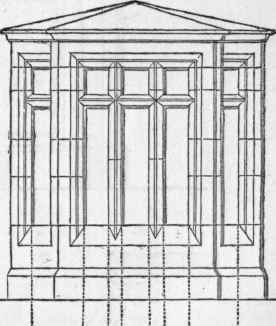 If the face of a window projects from surface of wall it is usually made as what is called a " bay window," illustrated in elevation, in fig. 361; the plan or outline of a bay window may be as fig. 362. A section of a bay window is given in fig. 15, Plate LIIL, with part of the sash window of upper storey. When the plan of a window is circular, as in fig. 363, it is called a "bow window," A being elevation, B plan. An "oriel window" is a window which projects from an upper floor, and is generally circular on plan. When the sash window is fixed, it is secured to a framing which leaves the opening in the wall, this framing being secured to wood bricks or grounds fixed in the wall. But when the window is "hung," it is placed in what is called a "cased framing," the sides of which are hollow, as at a a, fig. 5, Plate LIT., and the top piece or head is like the head of a door, this is shown at l, fig. 2, Plate XLVI. The lower part of the frame, as b, fig. 3, Plate LII, rests on the "sill," or "cill" a of the window; this sloping at its outer side to allow of the rain to pass off, and throated or grooved on the under side. The "cased framing," or "casing," is made up of pieces as follows. In fig. 5, Plate LII, h is called the " pulley style," or pulley piece, which supports at the head of the window the pulleys over which pass the cords which carry at their lower end the weights shown by the circles in fig. 5, Plate LII, at a a, and secured at the other to the sash frames of the window. 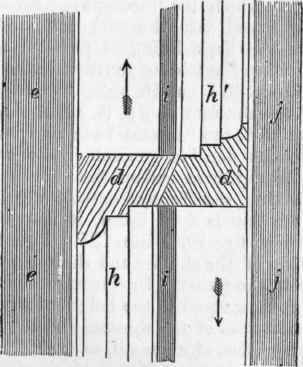 The pulley piece h is secured to the "outside lining" b and " inside lining " g, these two being joined by a piece parallel to h, and called the " back lining." To form the recess or groove in which the frame of the window sustaining or carrying the glass panes will slide up and down, two pieces are secured to the pulley style h h, fig. 5, Plate LI I; the piece j is grooved to the pulley piece and called the "parting bead," the piece i being secured to the "inside lining" g, and is called the "inside bead." To prevent the two weights in a and their respective cords - one being used to balance the lower and one to balance the upper sash - from becoming entangled, they are separated as shown in a a, fig. 5, Plate LII, by a piece called the "parting slip." All these pieces now described run from bottom " cill" of window to "head," to which they are secured; the inside bead i being generally fastened to the inside lining, so that it can be easily taken out, and release the sash frames when the windows require to be cleaned. Fig. 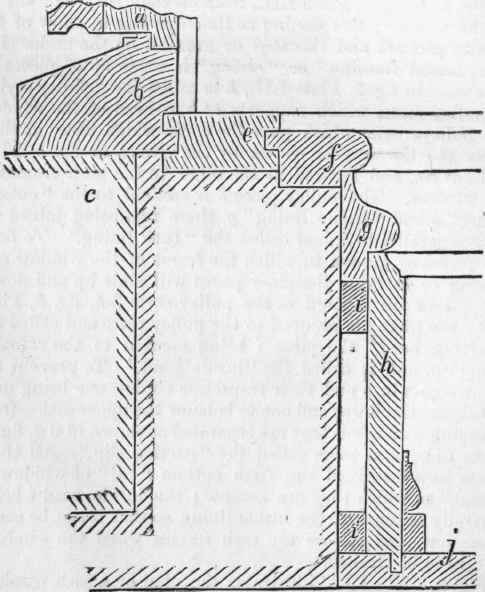 2, Plate LIL, illustrates the plan of a sash window, in which the shutters (see Shutters) e e are placed in shutter boxes a a, which are at right angles to the face of window, instead of being splayed or made angular, as is usually the case, as in fig. 5. In fig. 2 (fig. 1 being elevation at bottom), e e shows the shutters folded up, b c d the three parts opened up and covering the window. Fig. 3 is a section of lower part of window, a the "stone cill," b the "oak cill" of window frame, c the lower bar of sash frame, d "dado" lining the part below window, e e the mouldings of shutter box casing. In fig. 364 we illustrate the finish to the lower part of the central compartment of a bay window, a part of sash bar, b oak cill, c part of stone cill, d wall, e window call, f g h skirting board or dado, i i grounds, j line of flooring board. The upper part of window recess, parallel to floor, is generally panelled, and is called the "soffit" of window. Fig. 365 illustrates the "soffit" of the bay window; in fig. 364, a section of mouldings of " soffit" a, a, b bearer, c architrave, d "grounds," e plaster. In fig. 366 we illustrate the meeting of the upper bar d of the lower sash with the lower bar d' of the upper sash, e e the "inside lining," j j "outside lining," ii "parting slip."